Imagine getting off the train at Union Station on your way to a Dodgers baseball game and, rather than hopping aboard a shuttle bus, walking into an enclosed glass gondola and gliding up to the stadium, gazing down at the traffic and scenery below. It might seem like a far-fetched solution to L.A.’s public transit woes, but Mayor Garcetti has told the Los Angeles Times that the system could be fully operational by 2022. Today, the project took one step forward, with Metro sending out a formal Request for Information to the firm that is proposing the idea. 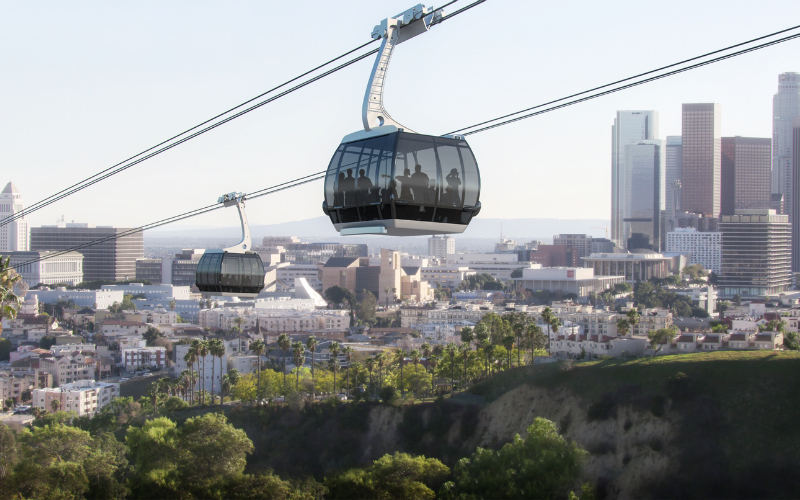 Aerial Rapid Transit Technologies—a company founded by Drew McCourt, the son former Dodgers owner Frank McCourt, who is also a major investor—submitted the plan through Metro’s Unsolicited Proposals policy. That policy allows private companies to submit ideas for major transit projects, and is intended to encourage creative, innovative approaches to the city’s transportation needs. All submitted proposals go through an initial evaluation phase, and then Metro picks out which ideas seem interesting enough to move on to a second phase of consideration. The tram was considered viable enough to move on to what’s known as Phase II Analysis, and now to this next exploratory phase. If it still seems like a good idea after all that, the next step would be to work out if the project would go to competitive procurement or if Metro would be locked-in to working only with Aerial Rapid Transit Technologies to execute the construction. “We take seriously any idea that provides a good alternative to driving, and we’re eager to consider this proposal from the private sector and advise our Metro Board accordingly,” Metro CEO Phillip A. Washington wrote in a statement about the gondola plan. It’s not the first time a gondola concept has been brought up. The idea was first floated in a 1990 study of transportation options for Dodger Stadium conducted by the Los Angeles County Transportation Commission, but, back then, nothing really happened with the idea. This time around, officials seem to be giving the matter a closer look. Other cities have developed similar projects, including notoriously traffic-clogged Taipei and London. In 2016, a traffic-snarled suburb of Mexico City opened a gondola transit route, which has ferried roughly 20,000 passengers per day since launching. Should the proposal move forward, Aerial Rapid Transit Technologies would take the lead on building the system, backed by $125 million in funding from Frank McCourt’s investment firm, plus additional private investments. The gondola’s drop-off station would be on private land, which McCourt already owns a 50 percent stake in and is currently being used as parking lots for the stadium. The land for the Union Station terminal would, according to the plan, be leased by the company from Metro. McCourt’s group has offered to reimburse Metro for costs associated with environmental impact reviews and other assessments of the project. In exchange, the corporation would retain the right to sell tickets for rides at a yet-to-be-determined price. RELATED: Answering Your Burning Questions About the Tunnel Elon Musk Is Building Under L.A.